Soon after I arrived in Uganda, I had the opportunity to visit Kyangwali Refugee Camp in Hoima district, western Uganda. COBURWAS, a partner organisation of Educate where I work, is based in the camp. The journey from Hoima district town to Kyangwali takes over four stressful hours on dirty bumpy roads. The camp was established in the 1960s for Rwandan refugees but, at present, it is mainly home to Congolese refugees. The official number of the refugees from Congo, Burundi, Rwanda and Sudan is between 20,000 and 25,000 in the camp although the refugees themselves say they are over 30,000. The camp shocked me. I grew up watching human suffering on television, with camps that were bare, overcrowded, full of tents and very temporary. Kyangwali does not stand out from the surrounding area. Villages, huts and agricultural land dot the 91- square kilometre camp. In fact, were it not for a flimsy barrier at the entrance and the guard huts, I would hardly have known where the border was. At first glance, it is peaceful, organised and even prosperous by local rural standards. There are several primary schools, crops grow well and there are a few trading centres and weekly markets. The land is plentiful; the camp is huge. On my first evening, I took a walk around with my hosts and was soon leading a troop of excited children. People were hospitable, approachable and eager to meet me. I spent a day and a half at the camp but it was enough to radically change my. I witnessed the signs of disease and malnutrition and, more importantly, was able to talk to some of the refugees. They spoke of terror back in their home country, but also in the camp, and their daily struggle to survive due to ir lack of status outside the camp. A lot of them have no identification from their birth country and rely on the camp IDs. I was told that leaving the camp is easy but getting back is hard: “fines” have to be paid. While I entered virtually unchecked, my fellow taxi passengers had to show papers, answer questions and pay dues. 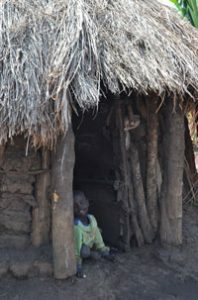 Kyangwali’s isolation, the restricted movement of its inhabitants, their lack of official status and a limited network in the host country make it very hard for refugees to integrate and build a life for themselves. However, there are people building positive changes within the camp itself: COBURWAS, for example, is a leadership and education empowerment organisation centred around a football club. 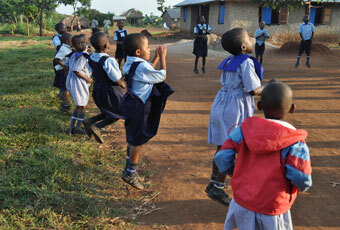 The members are creating change: the players travel around Uganda playing football. Some of the members have been able to find sponsorship to go to university and they are offering education opportunities to children inside the camp at nursery and primary school level as well as maintaining an orphanage. There are, however, systemic problems that are hard to overcome. Lack of running water and electricity are commonplace in the area but the absence of any medical support or road network within the camp, as well as the threat of displacement and violence, prevents any long-term stability for the refugees. The camp has no doctors. There is a basic health centre but it’s as good as useless. It has no treatment facilities. The second afternoon I was there, sitting on the football pitch watching the COBUWAS players in training, commotion ensued at the other end of the field. A group of men ran past, carrying a stretcher. I later learnt this was the camp ambulance. Since there is no road system, apart from the one road linking the trading centre to the main entrance, the manual stretcher is the only way to get people in need of assistance around the camp. The community fines men who do not take part in helping carry the patient in relays to the entrance, where the clinic is located. Disease is visibly rampant and malaria is the biggest killer. I saw women and men with various sores, malnourished children and, generally, quite a few noticeably sick children. During my hike around the camp, we stopped at a hut to ask for directions and the man of the house came over to greet us and help us find our way. I waved at the women sitting under the shade, they waved back and smiled and everything seemed normal. As we left, my guide turned to me and said that the man had just told him his only child had died the day before. There would be no big ceremony and there is no cemetery, so a shallow grave would be dug and the child buried somewhere nearby. 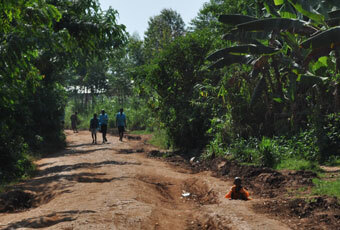 Refugees are assigned small plots of land when they arrive in Kyangwali. These plots, however, do not belong to them and there have been cases of people being displaced and moved, even when they had actually purchased the land. Most refugees start by building makeshift huts, which they then consolidate, expand and improve over time. They also cultivate part of their plot for subsistence. My host, a COBURWAS founder, has been living at Kyangwali for eight years. He has poured energy and effort into building a centre with a school that he knows he may have to abandon any time and to develop a community that may disperse at a moment’s notice or may be there indefinitely. I came to Kyangwali as a visitor, it was an exciting new experience, the weather was gorgeous and the people friendly. However, life in the camp is by no means easy. At one point, we passed an empty house and my guide indicated that the people had left. They found life at the camp so hard they preferred to go back to DR Congo. Children, some probably no more than five years old, are responsible for filling and carrying heavy jerry cans of water. They stay home to take care of their siblings instead of going to school. Crops seem to grow well but there is evidence that not everyone eats their fill. Camp communication is mainly by word of mouth and information is scarce and unreliable. The authorities are outnumbered and rarely venture into the camp. At one of the trading posts, while I waited for a boda to take me and my guide back to the COBURWAS centre, I started a conversation with a Congolese refugee. There are times when growing up in France and speaking French has its advantages, even here in English-speaking Uganda. This was one of those occasions as quite a few Congolese are more comfortable speaking French than English. The man had been at Kyangwali for about a year and was there with not only his wife and four children but also his brother, his only surviving relative. He told me his family had been persecuted and his parents and other siblings killed. So the remainder of the family fled and ended up in Kyangwali. Back in the DRC, this refugee had completed his second year of university and earned an Associates Degree in Language/Literature in French. Now, he could do nothing but be a farmer to try and provide for his family, as he is basically unemployable. The real tragedy is that some of the men responsible for his family’s massacre, now hunted in turn, also ended up in Kyangwali. He sees them daily but he can do nothing. This seemingly peaceful settlement, quietly basking in brilliant sunshine is in fact rampant with violence and corruption. His sister-in-law and her baby girl were recently murdered with machetes a few feet from where we were seated, he told me. The men responsible were arrested and released after three days. Some fled and others were expelled from the camp but some still remain. Corruption seems to be a way of life at Kyangwali, as is violence. A sense of powerlessness and resignation permeates the camp. And yet many put on a passive or, even, happy face. On my way back to Kampala, I sat next to a man leaving the camp. This 37-year-old Rwandan, with a wife and four children, was on his way to a hospital in Kampala. During our trip, he smilingly and proudly showed me his Rwanda and Kyangwali ID cards and then his African Center for Treatment and Rehabilitation of Torture Victims cards. This last one made my stomach clench involuntarily. He also cheerfully brought out his medical records, which stated that he had been assaulted in the Congo in 2007 and had had a bilaterally fractured tibia. He seemed more concerned with his head however and it transpired that he had been diagnosed with depression and PTSD (Post Traumatic Stress Disorder). Before his assault, he had been a construction worker and electrician but he was now unable to work and his wife, a tailor, was now the sole breadwinner for the family. But she did not own a sewing machine. The real question, however, beyond the dangers, discomforts and insecurity, is: what happens next? If there is nothing to go back to and no provision is made for you to be able to live outside the camp, what happens? The refugees I talked to all wanted to go back home, despite there being no family, land or resources awaiting them. But what of the children? Those who are too young to remember where they are from, those who have known nothing beyond the camp: what future is there for them? Even being multi-national myself, and having long struggled with the sense of belonging as a result, I can barely imagine their reality and, more especially, their future. Before coming to Uganda, I was a Peace Corps volunteer in the Caribbean and, as part of a project I was working on, I co-wrote a French primary school manual. When the director of the COBURWAS school mentioned that they wanted to teach the children French to prepare them for a possible return to Congo (they are currently only taught English at school) but that they had no teaching materials, I gladly offered them a copy. Kyangwali refugees are unfortunately very dependent on such charity. Am I allowed to I say I enjoyed my visit to Kyangwali? I laughed with children, I connected with adults and heard some entrancing stories, I hiked through a beautiful part of Uganda and I enjoyed a wonderful welcome and great hospitality. More importantly, I learned, I was able to ask any questions I wanted and share a little of the experience. Most of the members of my organisation, Educate, have been to Kyangwali and overall they describe their visits as wonderful experience, inspirational and life changing, if only because it dispelled their preconceived ideas of what a refugee camp was like. I felt a sense of quiet, in the seemingly calm environment, being there, a sense of simplicity. Then, after dinner, as the stars came out and the world went dark, save for the few flickering candles, a generator was produced. The television at the COBURWAS centre was tuned and there, in Kyangwali refugee camp, surrounded by countless refugees who have no idea what tomorrow may bring, we sat and watched Spain play Germany in the 2010 World Cup match. As soon as my baby girl is old enough, I’d like to emerge her in the world of volunteering. I can’t wait to experience the world with her, and my husband, at my side. Ahhhh, that’s really lovely Lesley. When are you due? I have 3! ranging from 4, 8 & 12… Still managed to do a ton of crazy stuff this year like the sky-diving, wing-walking, zorbing, aerobatic flying, zip-lining, bungee jumping, Vegas, Disney, etc this year. Becoming a Mummy is an absolutely amazing experience, and my children have all been bitten by the adventure and travel bug too… In fact, we are all going indoor sky-diving soon (you can do it from the age of 3) and my 12 year old is about to take part in a junior Ferrari track day and actually drive one for himself (lucky boy)!